DayRise Solar Enerdy Pvt Ltd is setup at Sonipat, which mainly deals in solar power and solar products while providing best in solar industry and reasonable panel prices ensuring quality and quantity in the solar competitive market. 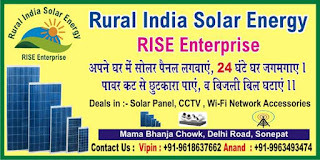 DayRise Solar Enerdy Pvt Ltd is aiming to provide solar energy in Delhi NCR specially rural villages in and around Sonipat, while providing cutting edge products, personalized service and in-depth consultation across all segments of solar energy. What next for renewables after Brexit?